I love chicken. Hubby loves beef. My son loves either one. I try to make dishes that alternate between chicken, beef, pork and have a meatless dish every week. While a chicken dish trumps a ground beef dish for me any day of the week, I am learning to make some pretty good beef dishes, and this one is no exception. My mother in law is the master of meatloaf. Her secret recipe? The one on the Lipton onion soup packets. I made her recipe for years and even put it in the crock pot, which resulted in a moist tender meat loaf with absolutely no crust. Hubby likes to put ketchup on top, which sits there like a blob...of...well....ketchup. I did not want to be dependent on the "soup packets" and found this recipe you are about to see. This is a definite winner in our family and far surpasses the traditional meatloaf we have been eating for years. Why? It's a great combination of ground beef, sausage, and oh, the glaze.....let me tell you about the glaze. A tomato-ey blend of tangy sweetness that has a slight kick. You know how the frosting makes the cake? In this case, the glaze makes the meat! 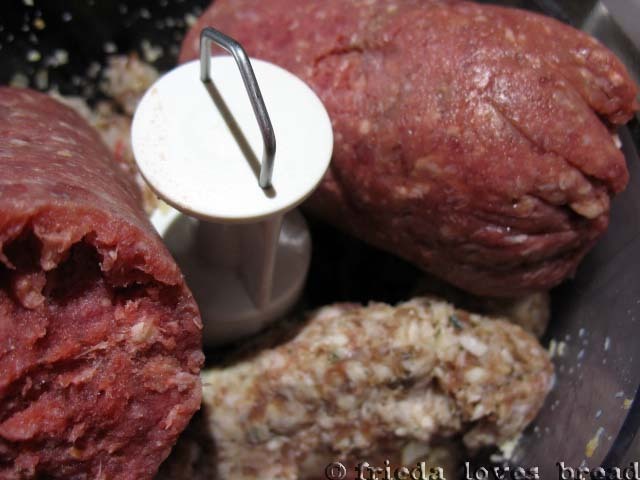 Ground beef and sausage are added and blended well. Everything is put into a large bowl: sauteed onions, garlic, eggs, and seasonings. 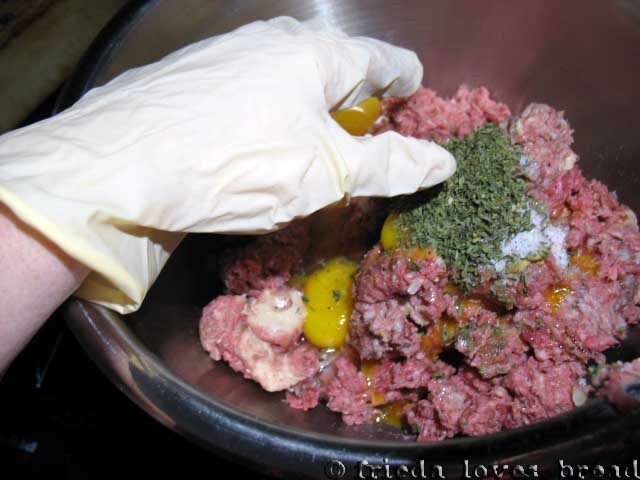 Your hands can be your best mixing tools, but I can't stand handling raw meat. and stuck under the broiler for about 5 minutes. This will give it a crust for the glaze to adhere to. 2 tablespoons of glaze are brushed on the top and put back under the broiler for 2 minutes. The meatloaf is baked for about 45 minutes, removed, tented with foil for 20 minutes to finish cooking and get all juicy inside. Ooooooh.....looking good! Cut yourself a thick slice and dip each bite into the best part. The glaze. 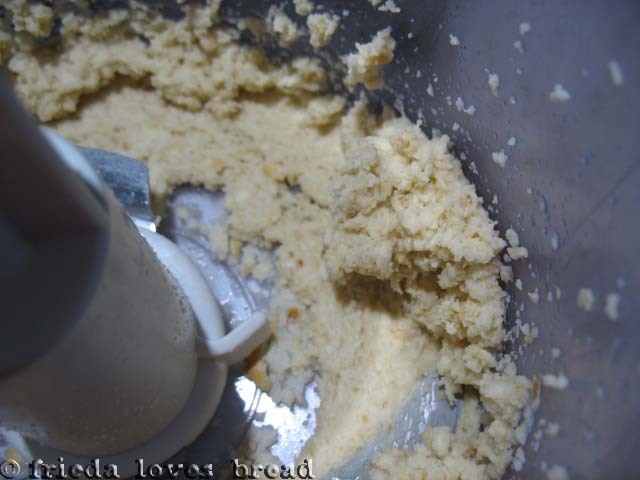 Next time, I will make smaller mini loaves and coat each one of them with this marvelous concoction! Oh this looks great!. 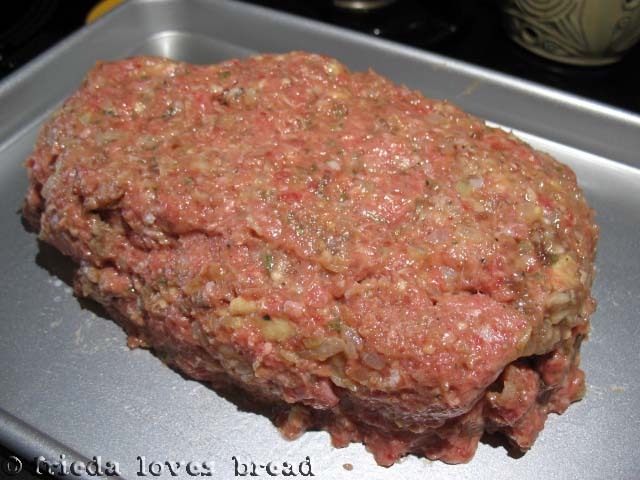 I also made long ago a meatloaf recipe somebody gave me from the states, and posted it. I love the crusty glaze part best too. It sounds great! Yes, Gwenevere, it has a crispy crust! That's why I want to make individual mini-loaves.....mmmmm! 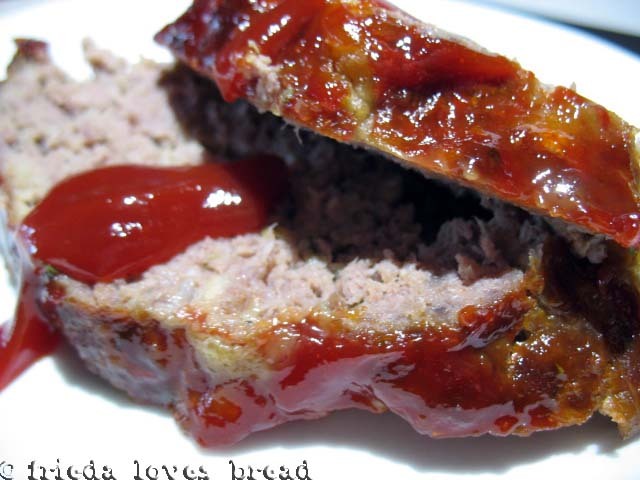 This is the way my mom always made meatloaf, except the hot sauce and the pan you use! I never thought of putting hot sauce in the glaze, but now that I think about it I bet I would love it. Mom always used a loaf pan of some sort, and I have cooked it that way or in a slow cooker for years. I just love how the glaze sticks to all sides on yours, and I will definitely try this next time I make meatloaf. You are right, the glaze does make this meatloaf truly awesome and having it all over rather than just on the top would make it even better! 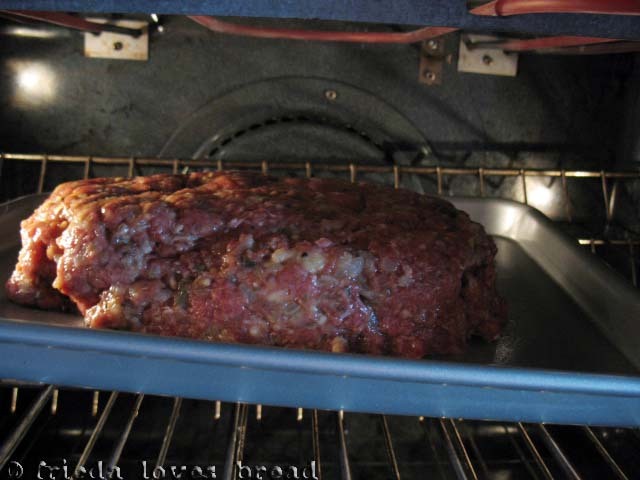 I always find my mouth watering whenever I read your blog...that meatloaf looks incredible. And the glaze totally seals the deal. Looks scrumptious!! Frieda help! 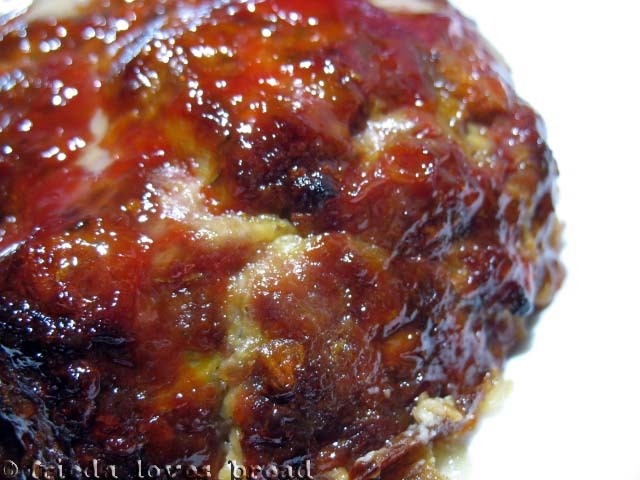 My man loves meatloaf too and I have mastered the flavor and the glaze to his liking. I mean he REALLY likes it. BUT, it never stays in slices. It falls apart in to meat clumps. What am I doing wrong? Michelle O, This same thing happened to me when I used a meatloaf recipe and put it in the crock pot. It was good, but one soggy mess. It is possible that your recipe has too much liquid (milk or even glaze or ketchup soaking into meat) anad/or not enough binding agents (eggs) to hold it together. 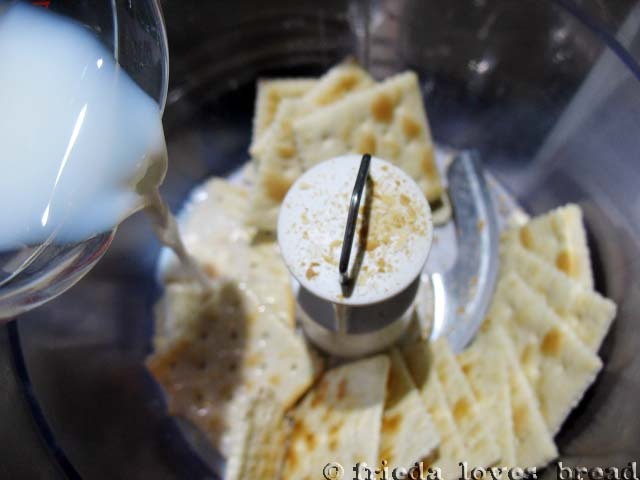 You should really give this recipe a try ~ I'm sure your man will love it! I can't access the glaze recipe. Is your recipe box down? It should work now ~ thanks for the heads up and enjoy the recipe!